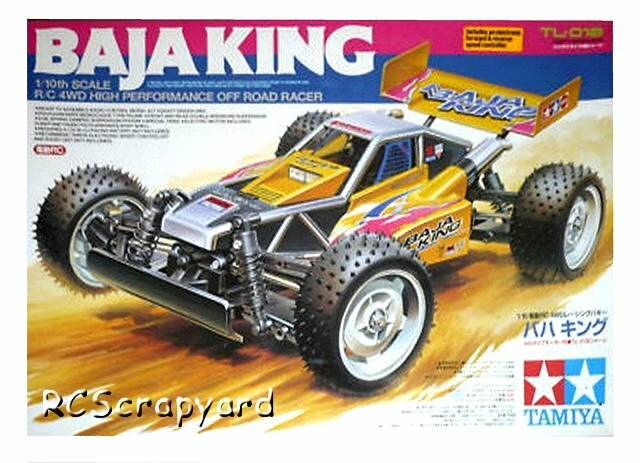 58301 • Tamiya Baja King • TL-01B • (Radio Controlled Model Archive) • RCScrapyard. 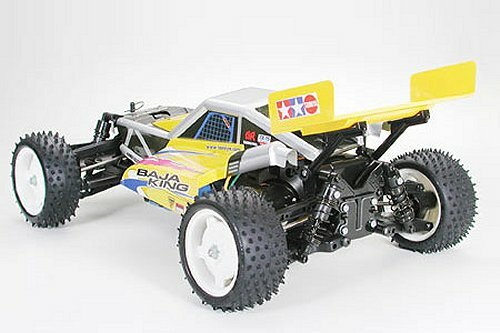 Released by Tamiya on December 18, 2002, the Baja King Radio Controlled self assembly model, is based on the TL-01B Chassis that was originally used for the Baja Champ in 1998 (#58221). Based on the TL-01 touring car chassis, considered to be the mainstay of Tamiya models during this period, the TL-01B was nothing more than the basic TL-01 chassis with longer suspension arms and bigger wheels. Because more than thirty different TL-01 based models were released, parts and spares for the main chassis of the Baja King are comparatively easy to find. Classed as a "beginners model" by some race-goers, because of its straight-forward design, a multitude of adaptations were possible to improve the cars performance level to compare with many of its more expensive rivals. The kit comes with plastic/nylon and sintered brass bush type bearings, that after a short while, when dust and grit get into them, actually wear into the metal drive shafts. If you are building this kit to race seriously these should be replaced by steel shielded ball bearings. 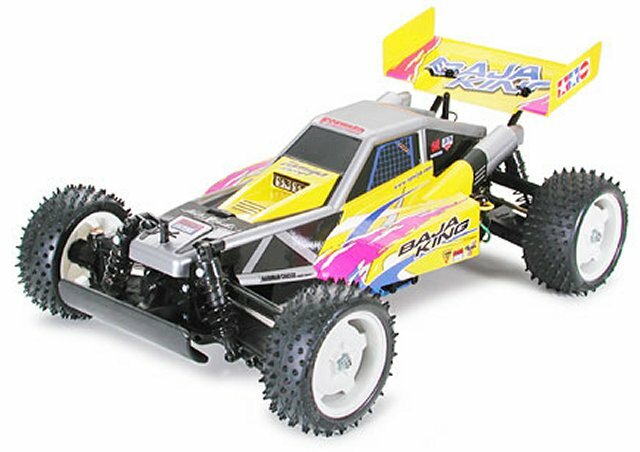 Buying a used Tamiya Baja King Electric Buggy, or any used RC Model, has a number of advantages. It is generally cheaper than new, ready built and may come with a variety of expensive hop-ups already installed. Cheap, pre-loved bargains are always becoming available. However, depending on the age of your purchase, it may need a little tender loving care before you can take it out on the back yard. If the body shell of your Tamiya Baja King is broken, ripped or damaged in any way, this can be easily repaired with rubber solution glue. Also, for added protection and if available for your Baja King model, fit an under guard to stop dirt and gravel entering the chassis. If you intend to race your Baja King Buggy model at a competitive level, I would also recommend you obtain and fit titanium pivot shafts, turnbuckles, tie rods and steering rods. The Baja King steering servo is also prone to damage. In high speed crash situations, the fragile gear teeth of the servo can be broken off, rendering your expensive servo useless, so be sure to obtain a good quality "Servo Saver". Check out my Servo Information article. 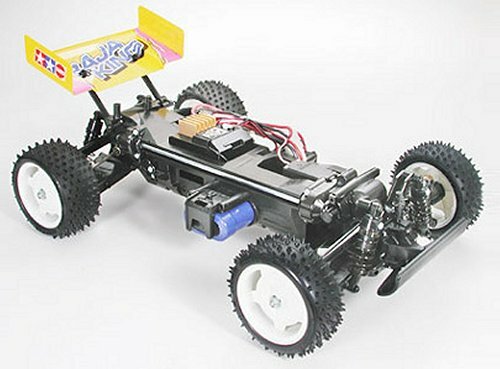 If body roll on your Tamiya Baja King is a problem, handling can be improved with the use of stabilizers, anti roll or sway bars, stiffer tuning springs and, or, thicker silicone oil in the dampers. Finally, good luck with your Baja King model and good racing. Out on the race track, the main thing you want to avoid is your car bouncing around all over the place, sliding, or even rolling over when you negotiate a tight corner. To prevent this you need to make changes, but before you make those changes you need to consider what your problem is for that particular track. How your model reacts when cornering … does it Under-steer? (Slide towards the outside of the corner) or Over-steer (Turns towards the inside of the corner). Does it react differently when you exit the corner to how it did when you entered it?